Open to find out TDW news! What's happening with your chapter? See Chapter News below. Send an article & photo to VicePresident@TDW.org. The recent Democratic victories in Virginia were a shot in the arm to Democrats across the nation who have been fighting the Trump administration on health care, gun control, taxes, immigration and other issues. The Democratic wins proved that grassroots campaigns with messages the voters want to hear will win. Senator Kaine said the Democrats in Virginia kept the message simple – education, jobs and healthcare. In the last election, we had many candidates who narrowed the margins of Republican victory with great grass roots campaigns. For example, in HD 115 a tenacious and determined candidate, Dorotha Ocker, came within a percentage point of flipping a district that was dismissed by pundits as being solidly red and unwinnable with little monetary support. When I look at the women currently running for office, I see a lot of Dorotha Ockers out there. They are tough, determined women who are already running great grassroots campaigns. Some will be supported by groups like Annie’s List but many others will not. TDW can help them. One big way that you can help is by attending and supporting our convention. It is TDW’s main fundraiser and allows us to provide funds for pro-choice women candidates in Texas. Last year we got a great start with a sold-out convention. This year’s convention is going to be even better. For example, on Friday night, Cindy James has arranged for a comedy/talent show in the hotel called “Over the Ledge” with Donna Howard and other elected officials. She also is arranging some great breakout sessions that will provide tips on effective campaigning for both rural and urban areas. Make your reservations early! If you can’t come to the convention, consider donating an item for the silent auction or perhaps purchasing a small ad in the convention program. Make no mistake, 2018 is going to be the most important election of your like. Knock, on doors, make calls, and support individual candidates. But also come to Austin in February and help TDW make a difference in Texas. The 2018 TDW convention is right around the corner - Feb. 9-10, 2018. You can register early and be assured of a seat by going to TDW.org/Events/2018 Convention. On that web page, you will find instructions and links on exactly what you need to do to register for the convention. Also, the location is TDW's traditional Wyndham Garden Hotel, 3401 South I-35, Austin, TX 78741. You must contact the hotel directly to reserve a room, or you may reserve your room online at www.WyndhamAustin.com. TDW obtained a discount for early registrants, less than last year's room price: Double $105, King $105, Executive King $115, and Casita $125. Enter 02066702TE 001 in the group code field for the discounted rate. For more information, call the hotel at 800/996-3426. The last date to register for a room at the discounted TDW rate is January 18, 2018. TDW is proud to announce that it has a brand new, up-to-date website - same domain - www.TDW.org. It is designed to be easier to use and understand. Check it out and let us know what you think! Send comments to VicePresident@TDW.org. 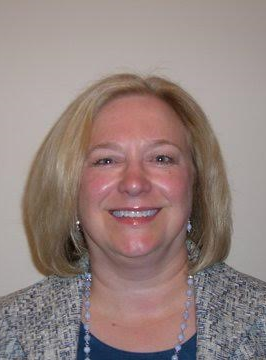 DO YOU WANT TO SERVE ON THE STATE TDW BOARD? As Elections Committee Chair, I want to make you aware of the deadline to submit your name, the office for which you are interested, and a short personal statement showing why you are qualified for that position. Just a reminder you MUST be a TDW member in good standing to run for office. If you are considering running for the President-Elect position, it is a 3-year commitment (President-Elect, President, Immediate Past President). Also, per current TDW Bylaws for this important position you are required to have previously served on the TDW Executive Board. The deadline is for submitting your application for any position is December 11, 2017 . You can either email me your information at tammie.hartgroves@hotmail.com or snail mail me at Tammie Hartgroves, c/o TDW of Central Texas, PO Box 2234, Waco, TX 76703-2234. 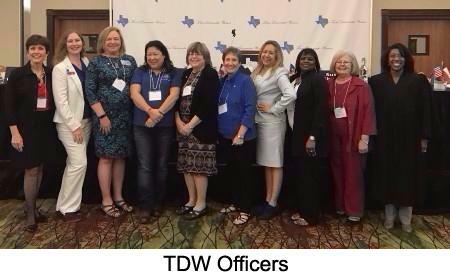 To learn more about the duties of each officer, go to our website, TDW.org/About/Bylaws. Article X describes the duties of each officer. I hope that you will consider applying for a position. If your chapter or a group of five or more have proposals for any changes to the TDW Bylaws, please send your revisions to Lenna Webb, Bylaws Committee Chair, info@ndtdw.com to be received no later than December 1 st , 2017. Notice of proposed changes must be sent to the TDW membership no later than thirty days prior to the Annual Meeting which is January 10, 2018. Therefore, the deadline for Bylaw amendment submission is: December 1, 2017. Below are articles from local chapters telling about what's happening in their "neck of the woods." 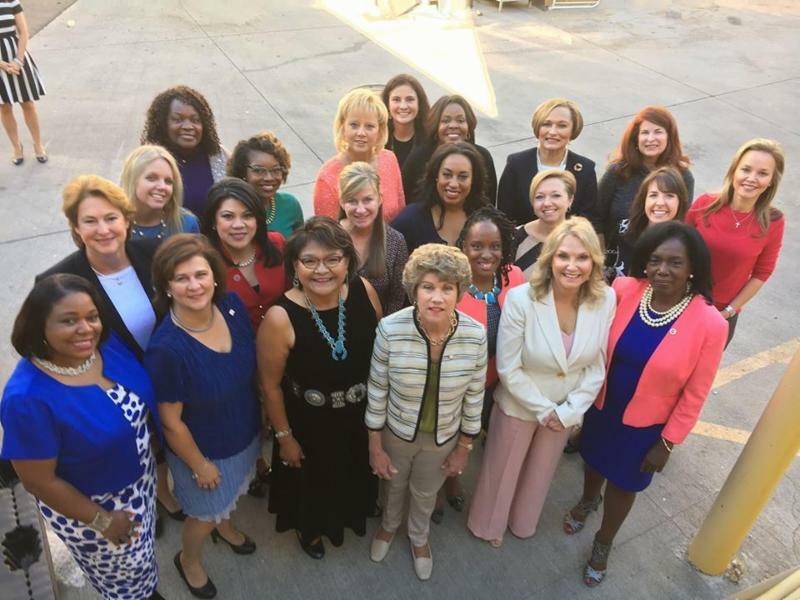 Congratulations to District Attorney Ogg and the elected women from across the nation selected to participate in class four of Governing Magazine Women in Government Leadership Program. #WomenInGovernment. Women can get it done! We must elect more progressive women. NDTDW is working with other Democratic groups in Dallas to educate voters for the primaries. On January 28, 2018 NDTDW will co-sponsor a Candidate Forum for primary candidates in Dallas wide races and local North Dallas candidates. In addition, NDTDW is co-sponsoring a candidate debate on February 18, 2018 for the top 4 Democratic candidates running to unseat Representative Pete Sessions in CD. 32. A educated electorate makes smart decision! Make politicking fun! Coastal Bend TDW members went all out in October! "Fun & Politicking" was the topic at the Coastal Bend TDW October meeting. 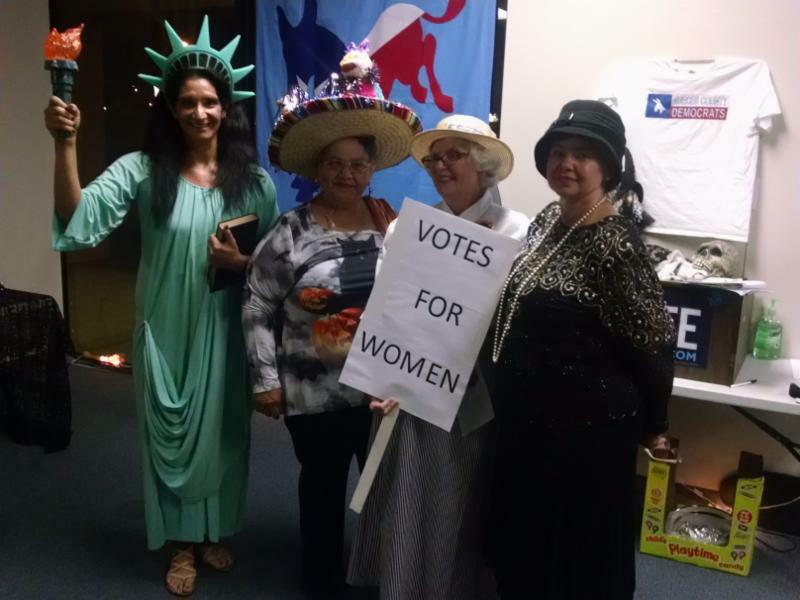 Pictured Members; Lori Acker, Carmen Duron, Margaret Diemert and CBTDW President Jana Longlois." TDW of Central Texas welcomed candidate for Agriculture Commissioner, Kim Olson on Oct. 25, 26th. Olson spoke to a great group Wednesday evening at Klassy Glass and on Thursday met with another group at Mission Waco's World Cup Cafe, then toured the Jubilee Food Market and Urban Reap, a sustainable garden and aquaponics project. Later Kim continued with TDW CT to a local farm/ranch operation, lunched with agriculture producers and finished her day touring the Hunger Relief project in Lacy-Lakeview. What a day in Central Texas! 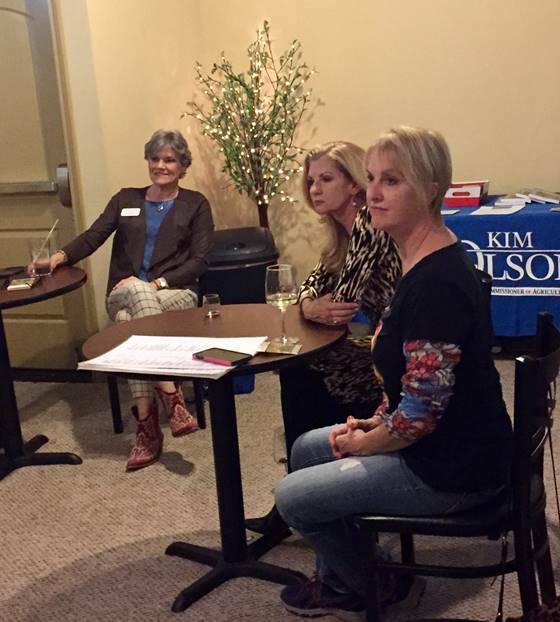 Kim Olson, a strong woman leader, is running for a statewide office, Agriculture Commissioner. We must support her! During this Fall 2017, TDW of Central Texas has continued its High School Seniors Voter Registration Project. The chapter made more than 20 visits to McLennan County High Schools in 2016, bringing the total to 65 students registered. The presentations in the high schools' government classes are fun for TDW members and informative for the students - with good results! The Heart O' Texas Fair and Rodeo has an average attendance of 175,000 people. 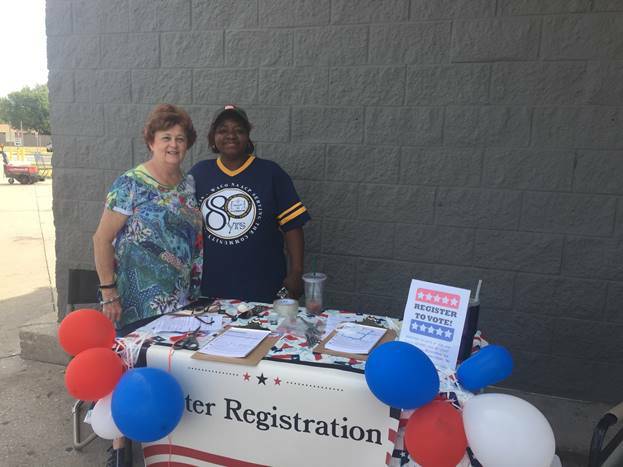 TDW of Central Texas partners with McLennan County Democrats each year to spread Democrats' Message and register voters. October 5-14th this year, 25 TDW of Central Texas members manned the 75 hours of the Fair run. We had a great time sharing the Democratic messsaage. TDW of Central Texas registered voters on National Voter Registration Day 2017, getting 34 new registrations! Volunteers Margaret Navorec, Gina Hackworth, Janet Wallace, not pictured: Mary Taft, Justin Rice, Mary G. Mann, Jackie Rhodes! 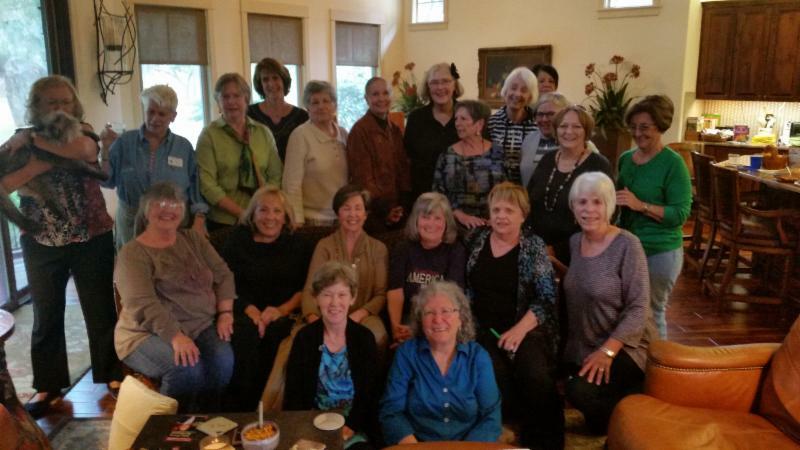 Because Highland Lakes TDW has had such an incredible year adding so many new members, this chapter asked to post a summary - a terrific year with terrific results. On January 21, 2017 HLDW in Austin, Texas put on those ‘boots (or pink sneakers) made for walking’ as they joined their sisters across Texas, the United States, and the world to advocate for worldwide legislation regarding human rights and other issues. The Women’s March is arguably considered the largest single protest in United States. Feb. 10 – 12, 2017 found members once again in Austin, Texas at the 2017 TDW 30th Anniversary Convention “Undaunted and More Determined Than-Ever as they took home numerous Star Awards. April was busy with the City Wide Garage sale raising record Scholarship funds, a 1st Place Ribbon in Burnet, TX. Bluebonnet Festival parade for Suffragette representation, and lastly, Austin, Texas Blue Ribbon Lobby Day. 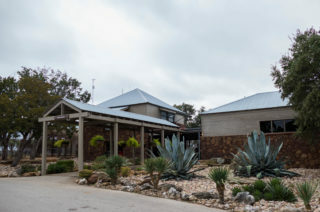 May saw planning for the TDW 2017 Summer Retreat at Canyon of the Eagles in the beautiful Texas Hill Country outside of Burnet at Lake Buchanan and the issuing of two adult women scholarship and one high school scholarship in the amount $1000.00 each. June – August the club focused its attention on a very successful TDW 2017 Summer Retreat at Canyon of the Eagles with over 125 attendees. Sept. – October has brought attention to the support of local, state, and federal candidates, elections and fund raising for the 2018 Scholarship fund. Congrats to the success and hard work of Highland Lakes TDW! Send your articles and photos to VicePresident@TDW.org - we want to promote you!